Note: One of our faithful readers sent this review in to us. Appreciating biased videogame opinion, we post it here for your pleasure. Shootout You as Goalie need to protect your goal or you as the shooter try to score. One on one action. Three in a Row Tic-Tac-Toe via stick to puck. The secret to win is to block the shot. King of the Rink Check or sweep players to gain the most points. A player knocked out of the rink earns extra points. Shooting Gallery Shoot the most windows out of a building while on rooftop across the way. Try getting them all in a row, diagonally, or make a design. Own the Ice Grab the puck and skate over 5 areas of the ice trying to change them to your color while your opponent steals the puck trying to do the same. Keep Away Gain points for highest time of puck possession and most successful passes to your team mate. Now to an actual hockey game—to begin with we would all yell out our preference for the various special themed ice arenas such as “let it snow in the disco arena”. We had customized the Viking team into our franchise team by adding players to match our personalities and physical characteristics. We made a player named Mr. Big who was gigantic— as big and tall as we could make him and who was announced on the ice as “Slim”. There was our favorite female player the “Black Knight” and our high scorer “Mark” followed closely by “Zeus”. I was of course named Mom, but was announced on the ice as “Mummy”. We had the most fun and challenges when we had a total of 4 players competing against each other. A player could change his position on the ice depending on the action or player he wanted to be (forward, goalie, etc). Since I was a beginner to start with I usually locked myself into one position so when I got lost I could scan the rink to find out where I had skated off to by looking for my number on the ice rink. Also by locking in my position I didn’t mess up the game so to speak by getting in the way of the action. As I became a better player I was able to not lock in and could change my playing position as needed. The intent of winning as many games as possible and performing certain tasks or goals was to unlock certain rewards which could be used in future games. It was strange to see elk and other strange characters as players as rewards. You could also earn equipment and experience points to boost your player’s attributes which was our goal. The ultimate challenge for the expert gamers in our house was to see if their Goalie could skate all the way down the ice to the opponent’s goal with the puck and score a point while leaving his goal unattended. The other players did their best to steal the puck. Lately other games have gotten my attention and the gamers are not around like they use to be. 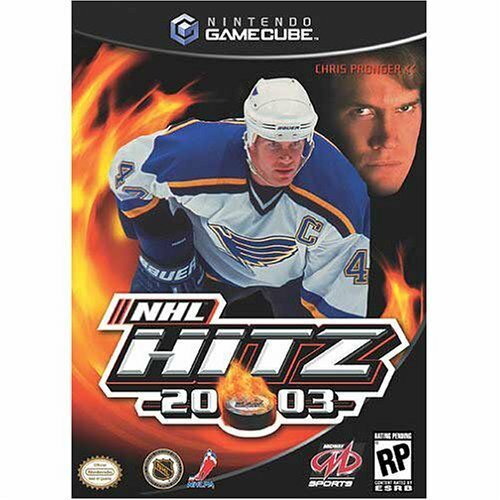 Once in a great while when we have the time, we get the game out and find Hitz 20-03 was always fun to play and still is.